This week on Lowlife we’re going to be doing something a little different. 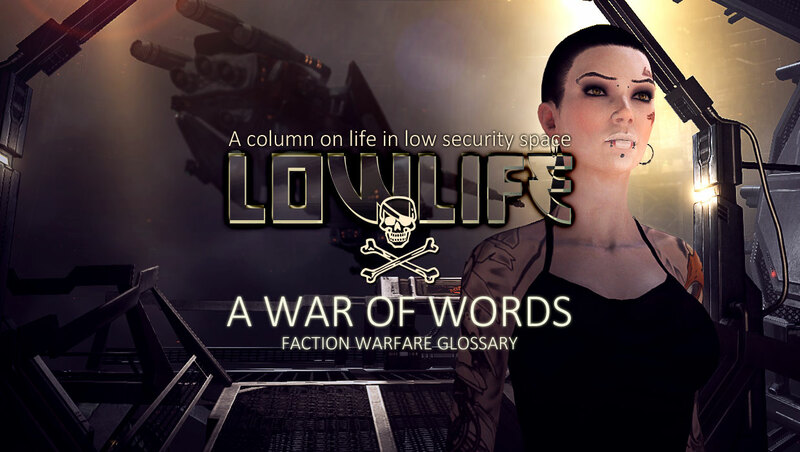 Many of the words used in Faction Warfare are quite specific for that area of EVE Online and it can be quite bewildering for a newcomer. It is difficult understand what’s going on or what is expected of you when you don’t understand the language. Indeed, I find that I must often explain myself when writing this column. Button – Refers to the structure inside a Faction Warfare plex (see “plex”), called “button” because the overview icon for it resembles a button. Often used in the expression “orbit the button”, which is actually not normally the case. To run a plex one must be within 30 km of this structure. Cockbag – Nickname for a fast locking Thrasher with artillery. Not unique to Faction Warfare or lowsec but rarely seen outside the area. Although these ships lack both tank and propulsion modules they deliver an impressive amount of alpha damage and can be fit cheaply. They are most commonly used for gate camps, station raids and, on occasion, hit-and-run tactics. This term actually originates from a Dominix setup. Criminal – A person that has an active criminal flag on them. This is not unique to Faction Warfare or lowsec, but important to understand for those that operate there. Often used on comms to establish rules of engagement. Many fleets in Faction Warfare will engage criminal and suspect targets as well as war targets. A person with an active criminal flag can be shot without loss of security status and sentry gun activation on gates and stations. Defensive plexing – Running plexes in a system held by ones own militia and thereby lowering the contested state – making the system more difficult for the enemy to take. See “plex” and “plexing”. Derptron – A cheaply fitted Atron, derived from the words “derp” and “Atron”. Normally fit with MWD and blasters. Although not unique to Factoin Warfare or lowsec this ship is by far most common there. It is often used by fleet commanders that utilize attrition warfare. Their main strengths are that they cost next to nothing, are readily available, can be flown by virtually anyone and can be deployed and applied to an enemy at great speed. Farmer – A pilot who is in Faction Warfare to collect loyalty points from running plexes (see “plex”) rather than fight. Often seen flying frigates with warp core stabilizers and cloaks fitted. You can read more about FW farmers here. Frog – Derogatory term for Gallente Militia. The term refers to French cuisine, Gallente being French in origin. Large – Short term for large Faction Warfare plex, see “plex”. LP dump or dump – The act of upgrading a controlled system by donating loyalty points at the infrastructure hub for the system. Often done across entire regions by large portions of a militia simultaneously in an effort to reach a higher tier (see “tier”). You can read more about this coordinated action here. Medium or med – Short term for medium plex, see “plex”. Novice or nov – Short term for novice plex, see “plex”. Offensive plexing – Running plexes in hostile territory. This grants more LP than defensive plexing (see “defensive plexing”) and the ultimate goal is to put the system into a “vulnerable” state at which time the infrastructure hub can be attacked to take sovereignty of the system. See “plex” and “plexing”. Overplex – The act of finishing plexes after a hostile system has been put into a “vulnerable” state. This does not grant any LP but the enemy must defensive plex back the equivalent to get the system out of “vulnerable” state. See “plex”, “plexing” and “defensive plex”. Pie – Although this is slang for “pirate” it almost exclusively refers to outlaws (-5.0 security status). Often used on comms to establish rules of engagement. Read more about pirates and outlaws here. Plex – Short term for “complex”. The official name for FW plexes is “Factional Warfare Dungeons”, but the term is virtually never used outside of EVE manuals and wiki pages. The term “plex” is also used in reference to PvE complexes, but within FW space the intended meaning is Factional Warfare dungeons, unless otherwise specified. Plexing – The act of running a Faction Warfare plex, see “plex”. This is done by staying within 30 km of the structure inside a plex, also known as the button, see “button”. Slide – “Sliding” is a way of entering a FW plex (see “plex”) without allowing enemy craft to lock and tackle you. It involves warping to the acceleration gate for the plex at 10km range and repeatedly clicking “activate acceleration gate” as the ship comes out of warp. If done right EVE will process the request to activate the gate before it processes any tackle applied. Small – Short term for small plex, see “plex”. Sniper Corm – A Cormorant class destroyer fitted for long range fire. Although by no means unique to FW or lowsec this ship is very common there and most FW pilots are expected to understand what it is. Squid – Derogatory term for Caldari Militia. Derived from the mediterranean dish fried calamari – deep fried squid. Gallente will often point out that squid lack spines and that this is the main reason the name suits the Caldari so well. Suspect – A person with an active suspect timer on them. This is not unique to Faction Warfare or lowsec, but important to understand for those that operate there. Treated the same way as a person with criminal flagging, see “criminal”. Tier – A measurement of the level of control a particular milia has within their war zone. Tiers are based to the amount of systems that are held and the upgrade levels of those systems (see “LP dump”). For every tier LP payouts for plexing (see “plexing”) and FW mission rewards are increased. Vuln – Short for “vulnerable”. A system that is vulnerable can be taken via destruction of its infrastructure hub.